What happens when you mix equal parts giant robots, mad science, interdimensional wraiths and megalomaniac A.I.? Just another day in the life of the Fightn’ Scientists of Tesladyne! After being sent out their first big assignment (which may or may not have involved a large combining robot), three Tesladyne scientists (and one bio-engineered cat) find themselves on the run. The United Nations, in a surprising move has blacklisted Atomic Robo, the head of Tesladyne, declaring him a traitor and threat to the world. Even more disturbing is that all communication with Tesladyne has ceased with no warning and Robo himself has disappeared from public view. Now cut off from any support (and possibly indicted as accessories to terrorism), the team must find out what happened to Robo and find out why the world has turned on them. 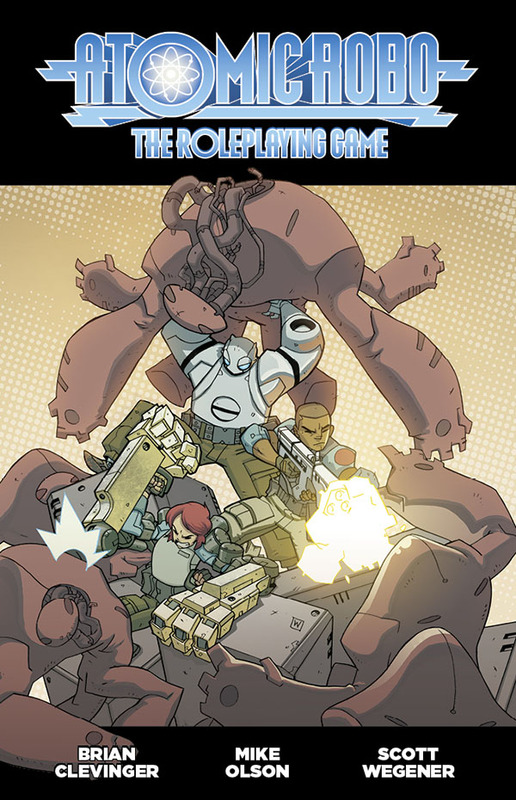 This campaign setting was developed by Aaron Carsten for the Atomic Robo Role-Playing Game by Evil Hat Studios. Episode 1: Just another day at work for Tesladyne. Another alien invasion and and the coffee machine’s broke too. Episode 2: Let’s visit Japan! Our allies there need help..from another invasion of monsters. Sigh. Episode 3: A giant monster is attacking Tokyo? Good thing we have an equally giant robot we can pilot. Episode 4: Our team is one part scientist, one part fugitive and one part crazy. Time to find the Tesladyne safe houses so we can fight back. Episode 5: The team has to get tech from a safe house but it may be trapped.Getting in requires finesse..not a team strength. Episode 7: The team faces their true adversary in a place they never expected. Fortunately, they have help from a source they never expected.